Malmsmead is miniscule but magnificent. It’s a tiny riverside hamlet hidden in a deep valley in the foothills of Exmoor. And for charm and romance there are few places in the UK which can equal it. This isn’t a place you find by chance, but it’s worth the effort. If you’ve been enthralled by Lorna Doone, the 19th century romantic novel, you’ll feel a sense of déjà vu. If you haven’t yet read Lorna Doone, add it to your bucketlist now, it’s a gripping page-turner packed with adventure and romance. And this is the real Doone Valley, where author RD Blackmore set his gripping Romeo and Juliet style yarn of star-crossed lovers and adventure. Winding hedgerow lanes lead to remote Malmsmead, up hill and down dale, past isolated farmsteads and across deserted open moorland. As you walk lanes steeply banked by hedges and ancient woodland along the valley, you could be retracing the steps of brave John Ridd, the lovelorn honest farmer, and his tragic Lorna with her long black hair and dark-pooled eyes. Remarkably little has changed here since the famous tale of 17th century Exmoor. 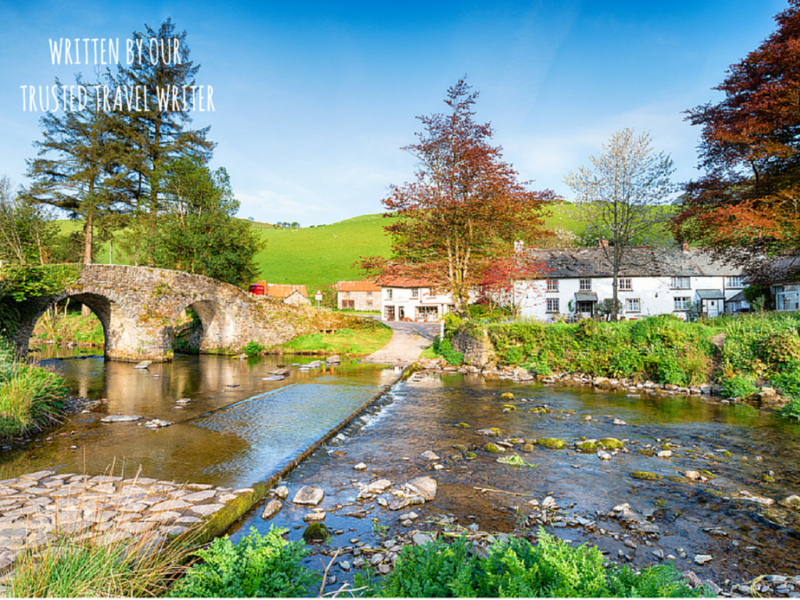 To experience the Doone Valley at its most romantic, leave your car in the car park at Malmsmead and follow Badgworthy Water on foot upstream, where fiction blurs thrillingly with historical fact. Badgworthy Valley has become Doone Valley, even according to Ordnance Survey. Blackmore’s terrifying Doone family was based on the marauding and murderous ways of an actual gang of Scottish outlaws who settled in the valley during the Monmouth Rebellion and tormented terrified Exmoor families. Blackmore may have been inspired by the parish records of nearby Oare Church, where his father was rector and where Carver shot Lorna through the window as she stood at the altar in the story. Oare Church is worth a visit, as is nearby Culbone Church, the smallest complete church in England, once a site of pagan worship and possibly where Joseph of Arimathea passed en route to Glastonbury with the infant Jesus. Less than an hour’s walk along the valley are the ruins of medieval Badgworthy village, the ‘Doone homestead’. Look out along the route for the Blackmore Memorial and the water slide at Lank Combe where John Ridd first set eyes on Lorna’s beauty when he scaled it to access the forbidden Doone stronghold. On return, the tearoom in Malmsmead is a splendid place to linger over a lavish cream tea beside the river. The heart of the hamlet is the picturesque 17th century packhorse bridge and ford, fit for a chocolate box and much loved by small people who appreciate Pooh Sticks and rolled-up trouser paddling. It’s a favourite of Bertie our Jack Russell too, who in his youth made repeated attempts at cracking the land speed record across the ford, much to the delight of happily drenched children. Pony trekking is a great way of enjoying this landscape, with gentle ambles for beginners from nearby Brendon Manor riding stables or longer rides over Brendon Common, with its glimpses of wild red deer, grazing Exmoor ponies and endless views to the Bristol Channel and Wales, and then down into the Doone Valley. If you feel safer on Shanks’s pony, you’ll get equally great views by tackling the steep climb from Malmsmead up to the Devon/Somerset border at County Gate. For a nostalgic day trip, head to the coast at the traditional resort of Minehead for sandcastling, fish and chips and an evocative journey on the 20 mile heritage steam railway. Rather more subtle is the pretty cove beach at Lynmouth, ‘Little Switzerland’ to the Victorians, where the fabulous water-powered funicular railway glides up the cliff to the twin town of Lynton above. A short walk along the South West Coast Path from Lynton leads to the Valley of the Rocks, a spectacular dry valley where feral goats balancing on precipices seem to have materialised from the pages of a fairytale. This is Exmoor at its best, an escape from the relentless stress of modern life and a journey into a simpler, rustic and very beautiful past.